Sponsors: Wenner-Gren Foundation and the University of Oxford (Middle East Center, Institute of Social and Cultural Anthropology and International Gender Studies Center). Geopolitical events such as the 2011 Arab Spring and current European ‘migrant [refugee] crisis’ have amplified dominant portrayals of ‘traditional’ Arab men from the Middle East and North Africa (MENA) as dangerous Muslim ‘others’. These essentialist discourses and monolithic stereotypes persist from the Orientalist legacy of veiled and disempowered ‘Arab/Muslim women’ and patriarchal ‘Arab/Muslim men’ who perpetrate war, brutality, radicalization and misogyny. Such dehumanizing caricatures render illegible the social realities of gender relations and how the lives of Arab men and women intersect. We believe this is a crucial historical moment to critically engage with these dominant discourses—and to reconceive them—based on cutting-edge scholarship on Arab masculinities being conducted by a new generation of anthropologists. This workshop brings together 20 scholars pioneering a ‘new wave’ of ethnographic research that is innovatively disrupting the dominant discourses and conventional approaches to gender in the Arab/Muslim world. Such a shift reflects mounting dissatisfaction with earlier anthropological and feminist work that tended to treat Arab patriarchy as timeless and taken-for-granted, thereby perpetuating hegemonic discourses of Arab manhood. We argue this is both outdated and out of step with much current gender studies research, not only in the MENA region, but in the Western academy more generally. In both cases, ‘crisis of masculinities’ discourses and the need to ‘save’ so-called disempowered Third World women are being vociferously debated. Our workshop presents a vital opportunity to advance a new anthropological field of Arab masculinities studies, in which theoretical frameworks, ethnographic representations and methodological strategies will be reformulated. This vanguard event has a concrete agenda to re-engage MENA feminist anthropology with the anthropology of men. 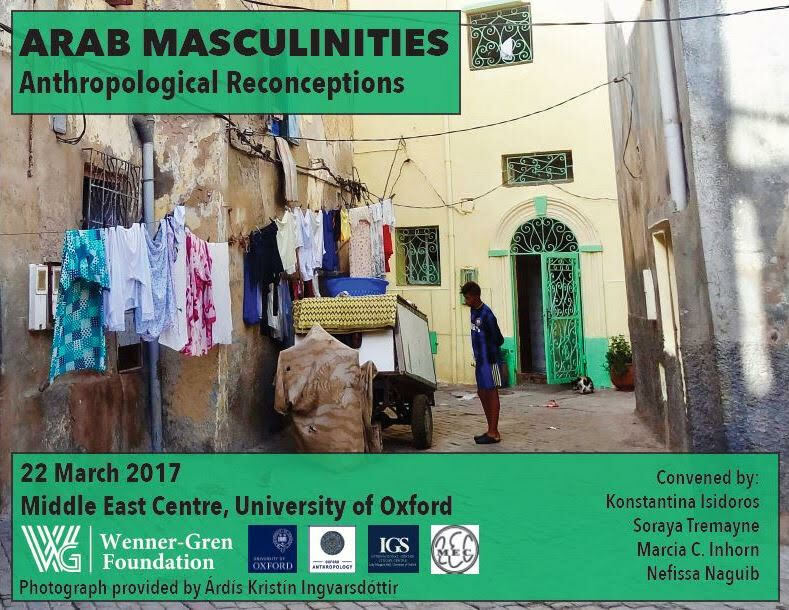 We are launching the new field of Anthropological Reconceptions of Arab Masculinities.